The award-winning Galway opera-pop singer and composer joins an unusual Gamelan orchestra collaboration in Dun Laoghaire. Combining a plethora of talents, Julie Feeney exploded onto the Irish music scene in 2005 with ‘13 Songs’, a delicately perfect Choice Music Prize winning album on which she personally plays no less than eleven instruments. Renowned for her theatrical and intimate live performances, she’s gone on to tour the world, write operas, play a ten-night stint at the National Concert Hall, become influential in fashion circles, and even qualify as a primary school teacher. It’s been a quiet few years for Feeney, however, and the way she’s chosen to return might surprise. Having contributed to an album alongside them in 2015, Feeney is now performing live as a much-valued guest of the Irish Gamelan Orchestra. Gamelan is the traditional formal, orchestral style of Java and Bali, in Indonesia, and it’s visually spectacular. It consists of drum and xylophone-style instruments, some of which are made out of metal, and some wood, alongside vocals and key changes far outside of western orchestral norms. 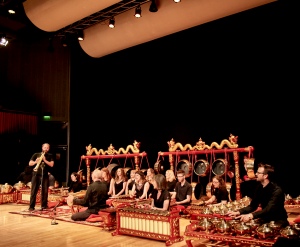 Feeney was originally brought into the Irish Gamelan Orchestra as part of their collaborative approach to music. 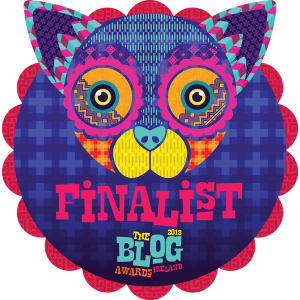 The collective invited star musicians with a classical edge – like the Galway-born pop-opera fanatic, and Belfast’s piano-meets-poetry artist Duke Special – to contribute alongside spoken word acts like author Joseph O’Connor (Ghost Light) and ex-Riverdance man Colin Dunne. Feeney’s been on something of a break since releasing 2012 album ‘Clocks’, her third, in part because of the arrival of two little ones into her life. It’s clear her children have had a profound effect on the composer, one that’s likely to flow into the content of her fourth release, expected sometime next year. As well as the album, which is in advanced in its progress, there’s also an operatic composition based on Oscar Wilde on the way. The album, which has no confirmed date just yet, will reflect that new depth, and it’s being produced simultaneously with a separate long-term project in the form of an adaptation of Oscar Wilde’s ‘The Happy Prince’, entitled ‘Bird’. The latter has been on the go for years for Feeney, and was close to completion in 2013, when she set it aside to focus on her children. That’s proven a smart move, as it’s now undergoing considerable alterations. There’s a passion behind these projects, one that’s always simmered in what Feeney does, which seems motivated by life experience (and the delicate expression of it) above all else. It’s captured in the story of a detour on a trip to Seattle, during which she was asked to travel to a remote district of Canada and perform for a loyal fan who’d recently been in a major accident. Feeney went, played no less than six gigs, and put on a fashion show, too. The pace is a little slower today, but the output no less wonderful. Feeney will be keeping things international whilst staying local, exploring those Javanese beats while she constructs her next solo masterpiece. With Feeney’s music traditionally of the sublimely mellow, emotional and vocally breathtaking variety, her Gamelan interlude might just invert a cliche: the lively storm before 2018’s perfect, beautiful calm. Julie Feeney performs in Dun Laoghaire with the Irish Gamelan Orchestra on Friday, November 11. She’ll play alongside other guests including Joseph O’Connor and Colin Dunne at the Pavilion Theatre, tickets available at paviliontheatre.ie.